Step out of the meeting room, immerse yourself in this idyllic rural location, and work together with your colleagues (or friends) to complete team challenges and activities whilst breathing in the fresh Somerset air. These rewarding and meaningful conservation activities are not only fantastic team building exercises, but they support the management of the reserve whilst improving staff well-being and team cohesion. Tasks vary depending on the time of year, but can include coppicing, charcoal making, tree planting and path maintenance. Watch our short video above to find out more. Challenge your survival skills in Folly Farm's ancient woodlands; learn how to survive and thrive in the wilderness, acquiring new skills, completing challenges and learning more about each other. 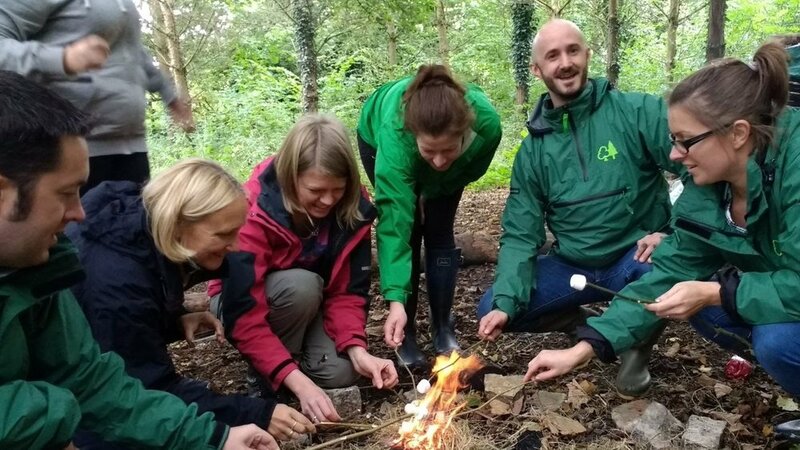 Activities include how to light a fire without matches, how to make a shelter and how identify the tracks and trails that wildlife leave behind. You will be challenged to herd a small flock of sheep in to a pen – what could possibly go wrong? Sheep herding challenges team members to learn and grow by taking them out of their familiar comfort zones. This 'ewe-nique' activity is ideal for building trust, collaboration and enhancing communication skills - it delves deep into people’s psyches bringing out all their motives and characteristics. Navigate your way around the Folly Farm reserve and into the ancient woodland, locating and completing challenges and mind-boggling puzzles set over this multi-terrain course. Teams will travel the same distance and complete identical missions but only the one with the most speed and ingenuity will make it back first, and complete the impossible mission! take over Folly Farm’s professional kitchen and work in small groups to produce delicious food under the expert guidance of our professional chefs. the event together enjoying your feast.